UFO SIGHTINGS DAILY: No nearby asteroids approaching says JPL/NASA data, Sept 25, 2015, UFO Sighting News. 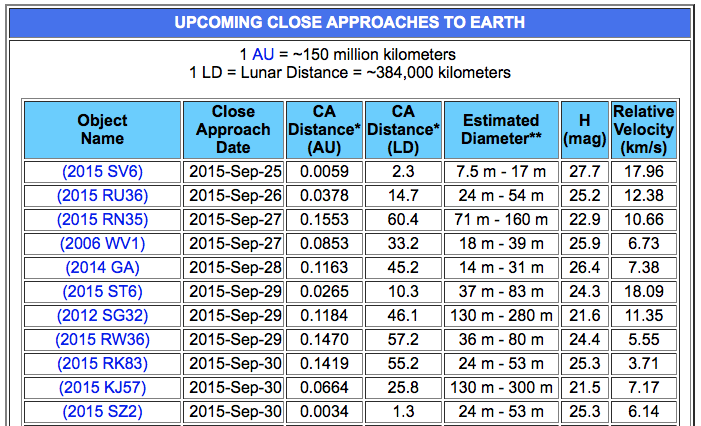 No nearby asteroids approaching says JPL/NASA data, Sept 25, 2015, UFO Sighting News. I've been hearing a lot of talk about an asteroid that is suppose to hit Earth between Sept 23 and 28th, but could find nothing to support it. If there is one, then NASA is hiding all the data from it. There is however two semi-close asteroids that are about the same distance from Earth as the moon is. The first of the two will come near us on Sept 25, but it will be 2.3 times the moons distance from us. Then on Sept 30 there is another that will be 1.3 the distance to the moon. That means its slighter further away than our moon. Thats still far off, so no worries.